Wraparound Services – Identity, Inc.
Wraparound services support Identity’s mission and programs by providing accessible, culturally sensitive mental health counseling and case management to youth and families. 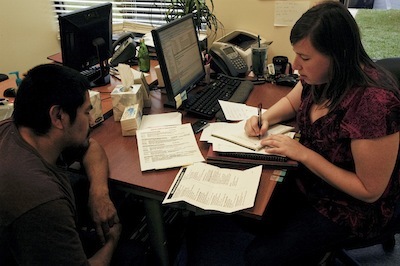 Identity has mental health therapists at its Up-County Youth Opportunity Center (in Gaithersburg) and at its Crossroads Youth Opportunity Center (in Takoma Park) who are available to serve uninsured or underinsured clients. Individual, couples, and family counseling are all offered in Spanish or English. The mental health program also provides internship opportunities for bilingual bachelor’s- and master’s-level students interested in serving the Latino community. Case management services are available to participants in all of Identity’s programs and to their families. Our bilingual case managers meet one-on-one with clients and their families to assess family needs and develop action plans. We also serve walk-ins. Case managers connect in-need youth and their parents to community services providing food and clothing, emergency housing, health and mental health services, and legal assistance. When needed, a case manager accompanies clients to act as translator, to assist with school paperwork and other applications, and to ensure that services are obtained promptly. Identity accepts client referrals for mental health services, case management, substance abuse counseling, and several other programs and services provided through our Youth Opportunity Centers (YOCs), which are located in Gaithersburg and Takoma Park.